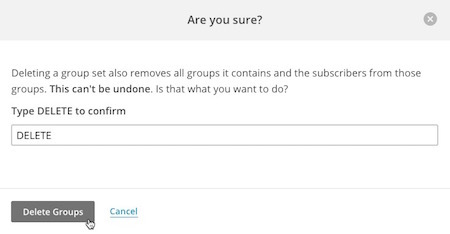 Groups can be deleted if you no longer need them in your Mailchimp list. All list actions are permanent, and can't be undone, so be sure you want to delete the group. When you delete a group, we don't delete any subscribers from your list, but we'll remove subscribers from the groups and delete the groups from your account. To remove subscribers from your list completely, you can delete or unsubscribe them from your lists. In this article, you'll learn how to delete a group name or group category from your list. To delete a single option (group name) from a complete group (group category), follow these steps. 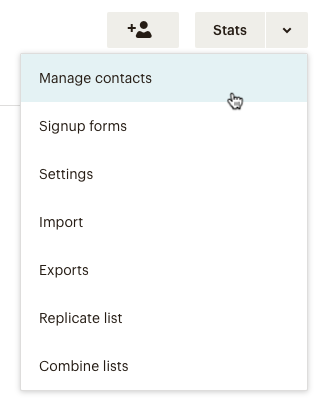 Click the drop-down menu next to the list you want to work with, and choose Manage contacts. Click the View Groups button for the group category you want to edit. Locate the group name you want to remove, and click Delete. In the Are you sure? modal, type DELETE in the field provided to confirm that you want to permanently delete the group, and click Delete Group. To delete a complete group (group category) along with its options (group names), follow these steps. Click the drop-down menu the list you want to work with, and choose Manage Contacts. Locate the group category you want to remove, and click Delete. In the Are you sure? modal, type DELETE in the field provided to confirm that you want to permanently delete the group, and click Delete Groups. It's possible to delete a Mailchimp audience, but we don't always recommend it. Learn more about permanently deleting an audience from your account.